* Soft creme pearls and brilliant crystals abound in this exquisite handmade bridal tiara by Mariell. * The center design is 8" w x 1 3/4" h and finishes with silver eyelets and can also be worn as an elegant bridal headband for beach or destination weddings. * Perfectly stunning, this classic tiara features lovely soft creme pearls, faceted crystal beads and bold pear-shaped crystals. * A beautiful addition to elegant wedding hairstyles, this wholesale bridal tiara is the perfect hair accessory for beach or destination weddings. 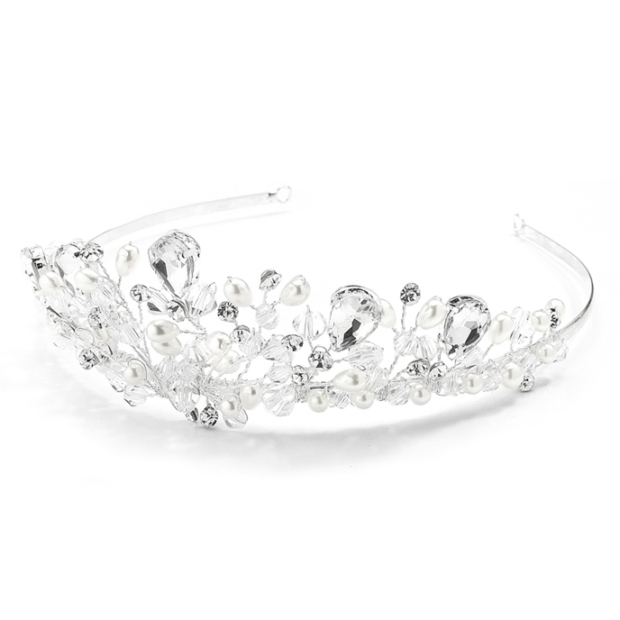 * Add this popular wedding tiara to your store's jewelry collection today!